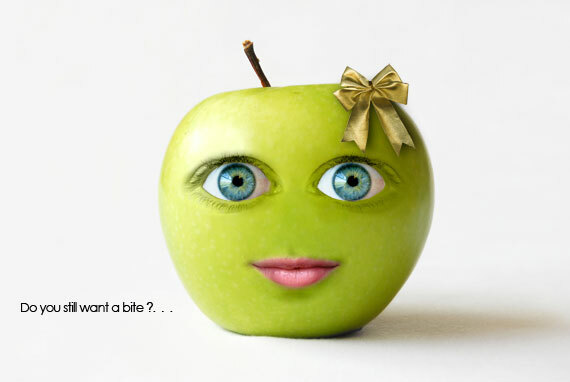 When it comes to photo manipulation, Photoshop is one of the best application that you can use. 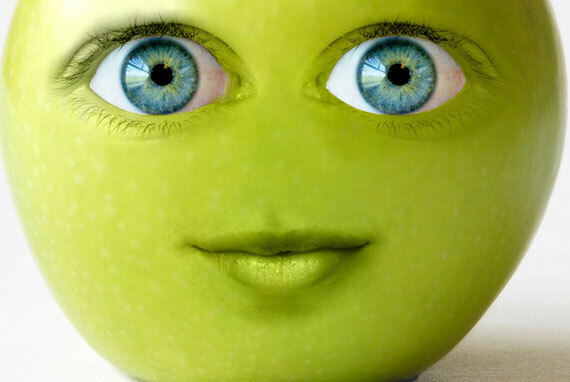 Talking about Photo Manipulation, Here is a quick tutorial where you can achieve to Create a Cute Green Apple by manipulating some photos. Throughout this tutorial, you will learn how to adjust an image to blend in a subject, and applying some basic Layers effect. Check out the preview on our tutorial for today. But before we start, try to download first this stock images that we will use for this tutorial. 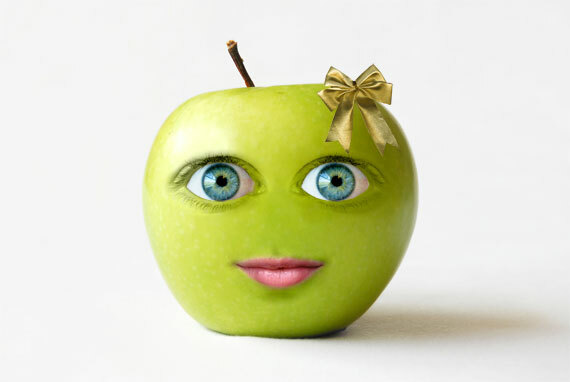 Lets start by opening the Apple image in photoshop. Open the Eye image then select part of the Eye using Lasso Tool (L). After you select it, move it to our Apple image using Move Tool (V). Let’s name the Eye Image to Eye1. Place the Eye image on the left position in the apple. Lets adjust the Eye1 layer more brighter. Go to Image>Adjustments>Curves. In Curves, adjust the Output to 139 and Input to 59. After that go to Image>Adjustments>Levels. In Levels, Adjust the Input levels to 57,1.22 and 248. Erase the sides using Erase Tool (E) Our Eye1 layer now should be like on this below. On Layers Palette, Set the Eye1 Layer to Luminosity. Choose Erase Tool. Right Click then Set the Eraser Brush to 300, Master Diameter to 50 and Brush Opacity to 20%. 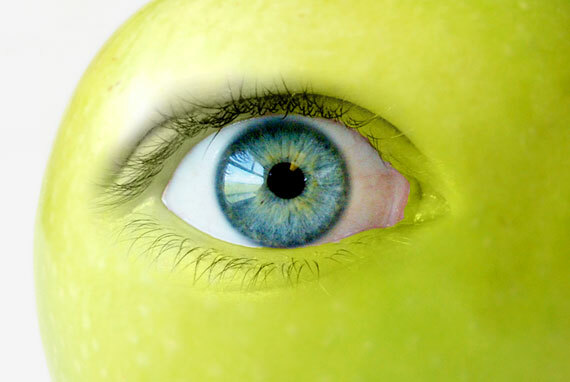 Now Erase the unnecessary image on the side of the eye so that the linings on the Eye image will be removed and blend the eye to the Apple. Here’s what it look like after we set it up. Now duplicate the Eye1 layer by CTRL+J. Then Set the duplicate image back to Normal and name it to Eye2. Select the Eye2 layer on the layers palette then select the eye ball part on the Eye2 using Magnetic Lasso Tool(L). Now that its selected, go to Select>Inverse and press DELETE on your keyboard so that the outside of the eye ball will be deleted. Our image should now look like this. Lets Group the Eye1 and Eye2 by simply click on the Add Group just beside the Add New Layer on the Layers Palette. Lets name our Group folder into “Left Eye”. Now Shift+Click on Eye1 and Eye2 layer and drag it to our Left Eye Group Folder. Right click on the Left Eye Group Folder then choose Duplicate Group then name to Duplicate Group to “Right Eye”. Now Move the Right Group folder to the Right. After you Move the Right Group to the Right you will notice that the right side is so bright and dont blend in the Apple. Inside the Right Group Folder, Select Eye1 Layer. Choose Burn Tool (O) then Adjust the Range to Highlights and Exposure to 50% then start using Burn Tool on the Right Side of the Eye1 until it blends to the apple. Select the Eye2 then go to Edit>Transform>Flip Horizontal. Now our Eye2 which was the eye ball image will be reverse in horizontal. Now we’re finish working on the Eye. Our Image will now Look like this. Since the Apple Shadow is on the right side and the Lips shadow is on the left side, we will Rotate our Lips1 layer to horizontal. Go to Edit>Transform>Flip Horizontal. Lets adjust it same as we did on the eye. Set the Lips1 Layer to Luminosity. 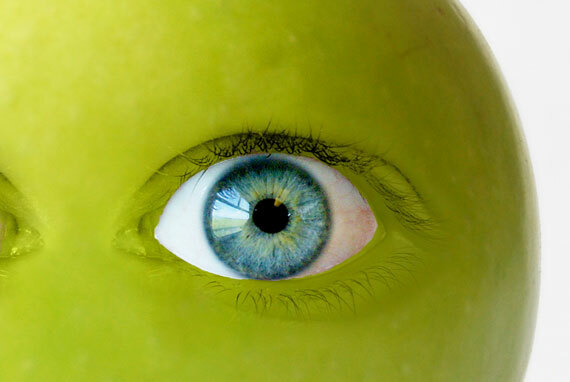 and blend the eye to the Apple. Choose Burn Tool (O) and set the Range to Highlights and Exposure to 10%. then apply Burn Tool on the Right part of the Lips until it blends perfectly to the Apple’s color. You should shift to Erase Tool then Burn Tool again since on this part we are blending the color until it match. Once your happy on the blending it will look like this. Now Duplicate the Lips Layer. Shift+J to Duplicate. 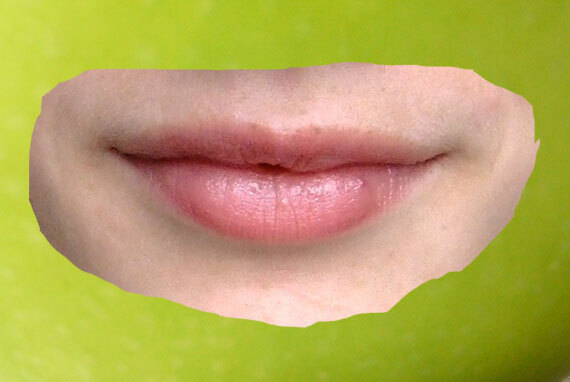 Name the Duplicate lips layer to Lips2. Set The Lips2 layer from Luminosity to Normal. Select Erase Tool (E) then Erase the outside of the Lips.Once your happy on the result it must look something similar to this one. And Now we are finish on the Lips. Here’s How it looks after we made her eye’s and her lips. Now Open the Ribbon Image. Select the Ribbon using Magnetic Lasso Tool. Move the Ribbon to our working document and simply name the layer to Ribbon. Again lets Scale it down so it will fit on the Apple=). Hope you like our tutorial for Today.Make sure to SUBSCRIBE NOW!!! to get updates on the Latest Tutorials. very nice tut:) thanks for share. Sry but my english is no good. Hi sweety,im not quite understand what you mean but if im not mistaken you pointing out the Step 6. To select only the Eye2 on the Right Group you should open the Group First. Then Click on the Eye2 Layer inside the Right Eye Group. then Reverse it so it will be the same=)Hope this helps. in the eyes have little red, right? Ronald, but why you reverse and Eye2 again? Now pupil in right eye and in left eye are different. If u want i can sedn picture in skype. Thanks for posting this tutorial! Easy enough to follow and very creative. Gave me some good ideas to try and apply this to other objects as well. Thanks again! Great tutorial on creating a green apple face, many of the techniques used here to create the apple face can be used to create other faces. Thanks for the great tutorial. Ahh, the problem is that when you copy the left eye to the right side, its SUPER bright and doesn’t fit in so well – what did you do to fix this? Dude, the apple looks like Zoe Deschanel. Thanks for the tutorial. 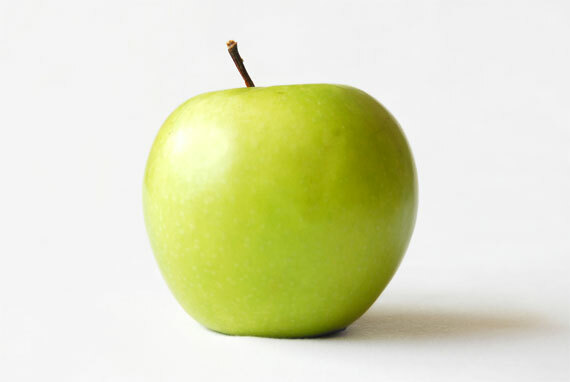 nice green apple! great tutorial at last. i’ve seen something like that on another photoshop tutorial site but this one is definitely better! very nice tutorial!!!! nice details and easy to understand. very good!!!! nice details and easy to understand. That is really very nice. I tried that too! You can see those photo manupulation I did, by clicking my name. I hope to those who want to use other people faces, they need permission first. Or else you can get sued! Thanks a ton. I just completed this in under an hour for a class assignment in multimedia & design. It was really useful and will help me in the future with other photoshop projects. Thanks again! Wow, astig talaga ang mga pinoy! I was just wondering why the red veins of the eye aren’t in the same spot. I realize that the pupils need to be identical to reflect the light, but the outer edges should be symmetrical. 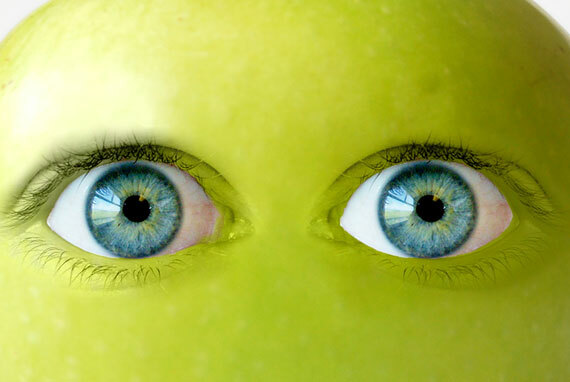 The more I look at the image,the odder and more annoying the two eyes become. If there any way to avoid..that. I couldn’t figure out how to do that…. 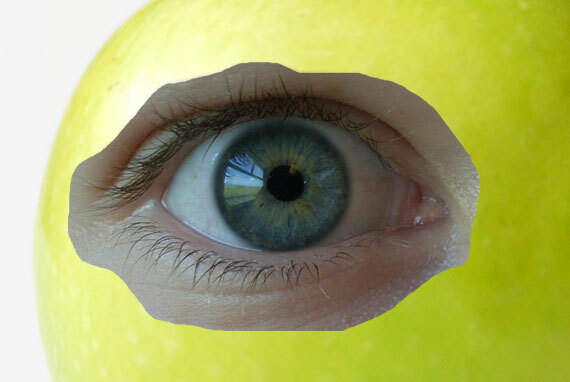 how to open the eye image….. i created a photoshop.com account, and I can’t make that apple!!!!! It’s not a site, it’s a program which he made with. Adobe Photoshop. Awesome man! I like the way you explain it.. Thanks for the great effort! Nice tut indeed, looks a lot like the apple in the annoying orange series on youtube. Eww. Creepy Apply. I won’t even think to bite. Thanks for the tut.